Today we present you the recipe for the gluten-free meatloaf. What differentiates it from normal meatloaves is the lack of gluten in the dough, that is usually present as bread softened with milk or breadcrumbs, two ingredients that are usually used to give compactness to similar preparations. To avoid this, just do not prepare a too liquid dough. 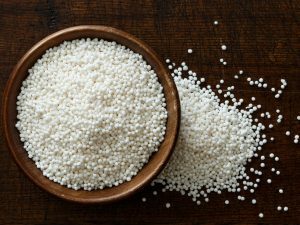 Then do not utilize milk and other liquids that, even if they would enrich the recipe, they would also force you to use a gluten-based mixture to dry everything. The meatloaf we made today presents a nice variation that makes it quite tasty: green olives. But nothing prevents you from adding other ingredients, or replace these. You can add to the dough some sautéed mushrooms, for example, or boiled spinach cut into small pieces, or a crumbled raw sausage (making sure of course that it is gluten-free). 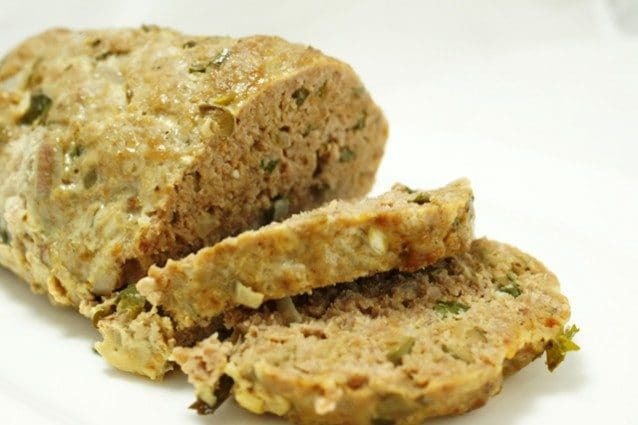 As you can see, the variations are numerous, and there is no limit to the recipes that you can create with this basic dough for the gluten-free meatloaf. To prepare the gluten-free meatloaf you must start from high quality ingredients, first of all the minced beef meat. I usually go to a butcher shop, then choose a good cut of beef and then I make it chop to get some excellent quality minced meat. 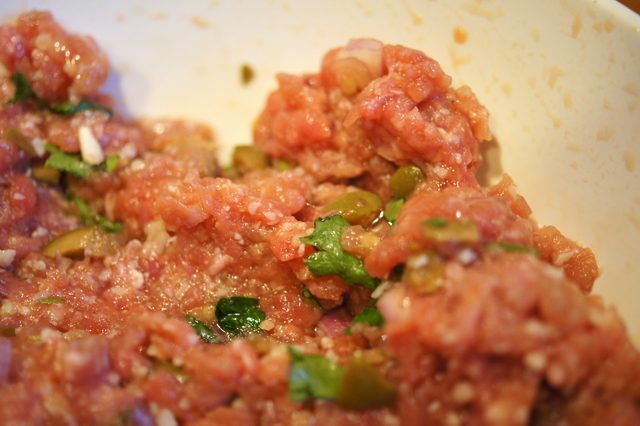 Put it in a large bowl, it is the first ingredient that you will utilize for your gluten-free meatloaf. Then take the parsley, wash it, cut away the thicker stalks, cut it with a mezzaluna knife or a sharp knife into small pieces and add it to the bowl with the minced meat. Then peel the garlic, squeeze it, and add it to the mixture. 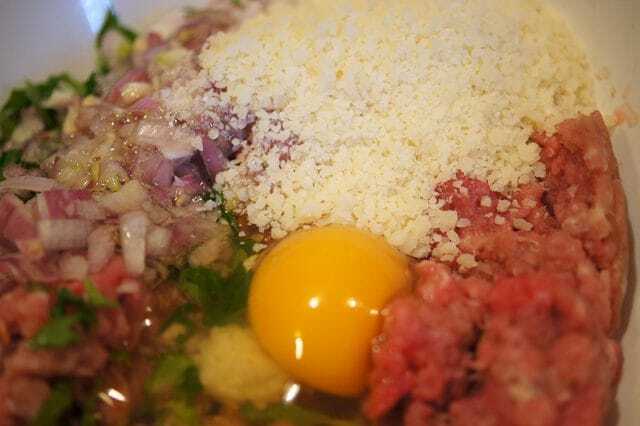 Add also the shallot cut into very small cubes, the grated Parmesan cheese, the whole egg (which will act as a glue) then add salt and pepper as you wish (remembering that there is already the savory part given by the Parmesan cheese and the olives you will add later). Finally, as a distinctive touch to the recipe, take the olives, remove the pit and chop them up into small pieces. Add them to the mixture. By hand or helping yourself with a fork, amalgamate everything well to create a homogeneous mixture. In this recipe gluten is missing, because there is neither bread nor breadcrumbs. Usually these ingredients are used both to give softness and to dry the mixture. 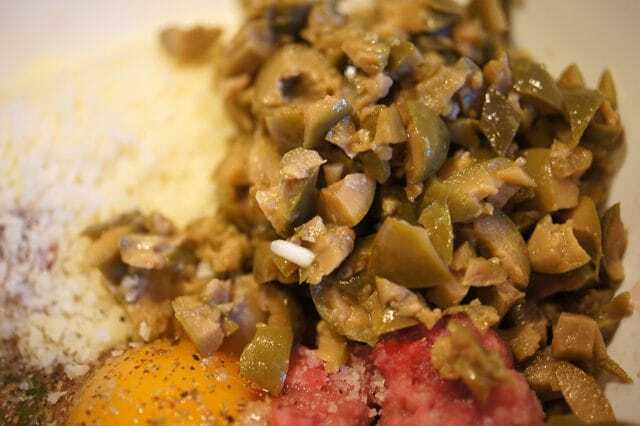 To avoid a mixture too liquid that needs to be dried, just avoid using milk or another egg (which the recipe would require, if the meatloaf was not gluten-free). At this point, cover a baking tray with some baking paper, create a large sausage with the mixture of meat and place it gently into the baking tray. Sprinkle it with a bit of extra-virgin olive oil and cover everything with aluminum foil; this will allow the gluten-free meatloaf to cook without drying too much, it will remain soft and – moreover – it will not dirty the oven with splashes of sauce everywhere (that is quite good!). Finally, bake in a hot oven for about an hour at a temperature of 180 degrees. Once cooked, take the gluten-free meatloaf out of the oven, let it cool down, cut it and serve.